The Guide to Bruce Springsteen on Bootleg CD. The third book (and last, to date) in Backstreets reviewer Lynn Elder's series of guides to the bootleg recordings of Bruce Springsteen. 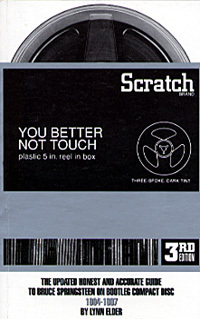 YBNT3 covers the roughly 200 new Springsteen bootlegs released between August 1994 and June 1997, after the publication of Volume Two in the fall of 1994. Many of the discs reviewed here document the 1995-97 World Acoustic Tour in support of The Ghost of Tom Joad. The purpose of this guide is to assist you in determining the best available bootlegs and to help you avoid titles that don't deliver. As usual, this latest YBNT is thorough, honest, and well-illustrated. Listings for each disc include separate 1-10 ratings for sound quality, packaging, and performance; overall star ratings of 1-5; track listings; comments and more. Like the first two volumes of YBNT, Volume Three contains an appendix listing all of the titles in the book by their star ratings, this time adding all the titles from the first two books to make this appendix a comprehensive overview of all Springsteen bootleg CDs through 1997. For the first time, the new volume also adds two more appendices: one lists Elder's selections for the best titles from every tour, and another extensive appendix is a timeline that lists all the shows to date that have been released on CD and the title(s) on which they appear. At a massive 232 pages, this volume of YBNT is the biggest one yet by far. YBNT 1 and 2 are now sold out, so get YBNT3 while it lasts -- a relic of another time, perhaps... but still a great resource for collectors.